Microseism energy bundle — a bundle that contains a series of Python scripts to compute microseism energy using PSDs from the PSD database created by the PDF/PSD bundle above. Microseism energy plots reveal coherent variability of microseism noise at the stations as well as those caused by major storms. 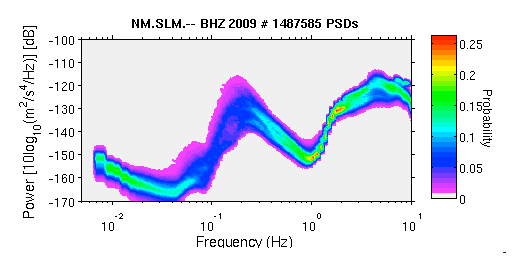 Frequency dependent polarization analysis bundle — a bundle that contains a series of Python scripts to perform polarization analysis of seismic noise recorded by three-component seismometers. IRIS DMC (2014), Data Services Products: The IRIS DMC Noise Toolkit, https://doi.org/10.17611/DP/NTK.1. IRIS DMC (2014), Data Services Products: Noise Toolkit PDF-PSD Noise Toolkit PDF/PSD bundle, https://doi.org/10.17611/DP/NTK.2. Koper K.D. and V.L. Hawley, “Frequency dependent polarization analysis of ambient seismic noise recorded at a broadband seismometer in the Central United States”, Earthquake Science, 23, 439-447, 2010. IRIS DMC (2015), Data Services Products: Polarization Attributes bundle, https://doi.org/10.17611/DP/NTK.4. IRIS DMC (2015), Data Services Products: Noise Toolkit Microseism Energy (ME) bundle, Anthony, Rob and Rick Aster, https://doi.org/10.17611/DP/NTK.3. Rick Aster and Rob Anthony, New Mexico Tech and Colorado State University, Microseism Energy/Event Data Product proposal, DPWG meeting at AGU 2012.